The last couple of months have been very busy for me as ever (tell me something new! ), so I was not able to get to every event that I would have liked to. 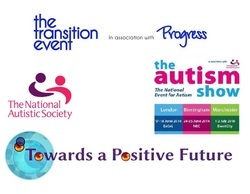 However, I was able to attend the Transition Event run by Progress Magazine at the end of May. There were a mixture of inspirational and practical speakers. I most enjoyed hearing from one, Huw Davies, the Chief Executive of the British Association for Supported Employment, who provided us with information about employment support being provided to young people with SEN/disabilities. Huw said that there was a real need for inspiring role models to encourage young people to dream and aspire to things, rather than just saying that something is unrealistic for them. He also made the point that work is possible and positive for many of us, but we are often caught up with low expectations and low aspirations which often means that, by the age of 26, disabled people are more likely to be unemployed. Huw added that we should be looking more towards attainable work, the growth of personal budgets to use for job coaches and, most importantly, considering a presumption of employability for disabled young people leading to sustainable employment. ​He also made the point that everyone was able to work with the right job and right support and that we now needed to look towards full inclusion and providing real jobs which are valued and not just tokenistic ones. Huw also said that sometimes the best thing is for young people to learn about work through supported internships, as they often learn best in ‘situ’ under real job conditions, for things like time keeping/dress codes/learning how to do deal real work. Finally, Huw also said that, as well as the effect on young people with SEN/disability, there would be an impact on employers too, because it would increase the morale of their workforce.